Many of us are familiar with having syrup on our flapjacks or splurging on the sweeter (but more expensive) real maple syrup. Ever had sorghum syrup? It is similar to molasses and can be quite sweet, to go easy on it until you know what you want. There are other uses for this flowering grain that is in the grass family. Some varieties of this genus can grow as tall as an adult. Sorghum has many uses including cereal and feed for livestock. It also has a way of thwarting evolutionary tales. This stuff is resistant to drought, which is one reason it is popular in many parts of the world. 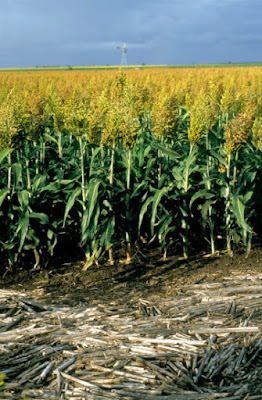 Research on Sorghum bicolor shows that when it detects a drought coming on, it changes its root system to compensate. Microbes on the roots that have had the pleasure of a mutually-beneficial relationship fade away, and other microbes take over. And back again, as needed. Proselytizers of particles-to-plant evolution can only hem and haw, offering no reasonable model or explanation for this activity. Yet again, we see that the Master Engineer has designed something to adapt to its environment. The drought tolerance of a popular grain, sorghum, makes it an important global food crop. A recent study finds that sorghum manipulates soil conditions to promote a beneficial change in the microbes living on its roots when water is scarce. The complex systems conferring such tight cooperation between plants and microbes point to a wise Creator for their origin far more reasonably than the mystical scenarios invoking strong “positive” and “negative” selection events offered by the researchers. To read the rest, click on "Sorghum and Bacteria Cooperative Design".